Share our USA Today ad! Joined by our partners, Alaska Wilderness League is running this ad in USA Today to make sure the public knows how disastrous Arctic Ocean drilling would be for our planet’s climate, as well as the seals, whales, polar bears and walrus that call the Arctic home. Can you help amplify our message by sharing the ad on Facebook or Twitter or emailing it to your friends? The evidence that Arctic Ocean drilling would be disastrous is so compelling. Just recently, the journal Nature concluded that Arctic fossil fuels must remain undeveloped if we want to avoid the worst effects of climate change. 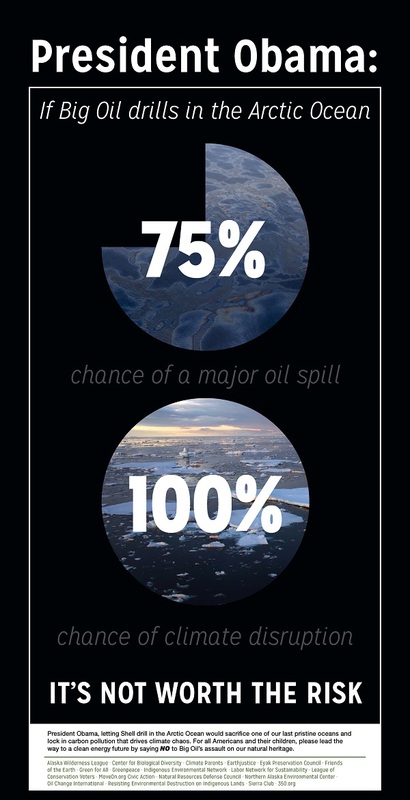 Plus, the government’s own analysis reveals a 75% chance of an oil spill if leases in the Chukchi Sea – where Shell is currently seeking to drill – are developed. Seals, walrus and polar bears are already struggling with the ice shortage in the Arctic Ocean. Don’t let Shell make things worse! Spread the word! Click the above to open your email browser, or copy and paste the message below into an email message. Your email(s) have been sent!